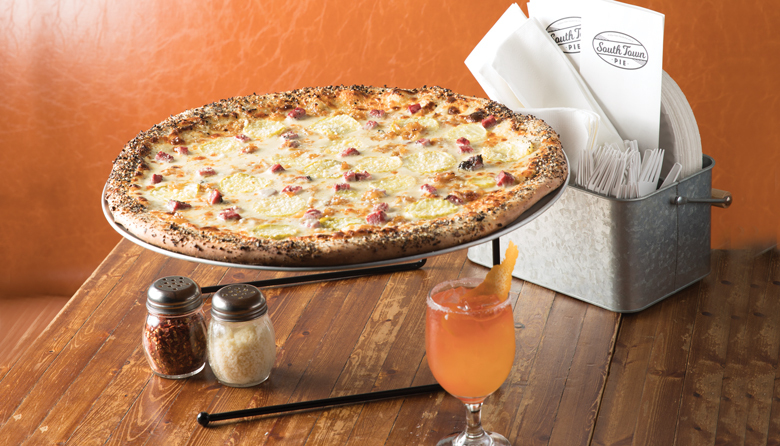 Piece of the Pie: The pastrami pizza is a best seller, for good reason. Sam Crannell, chef and owner of Queen Anne’s notable but now shuttered LloydMartin, says that when he moved to Seattle from Chicago in 2005, you couldn’t find a decent slice of pizza here. You know that old adage “If you want something done right, do it yourself?” He followed that notion more than a decade later, saying yes when business partners approached him about opening a pizza place. Although he admits there are many awesome slices available in Seattle now—he sings the praises of Delancey’s, for example—he and partners Rob Coburn and Paige Crandall (of Fremont’s El Camino) opened South Town Pie in South Park in May. Crannell ended his six-year run of LloydMartin after New Year’s Eve service, just months before opening South Town. The two concepts (and neighborhoods) couldn’t be more different: one was a petite, popular date spot where regulars loved the inventive pastas and perfect sauces; the other is a purposefully low-brow, family-friendly restaurant where you can get a decent cocktail and a slice of pepperoni pizza. He meant for the two restaurants to coexist, not for LloydMartin to close to make room for South Town. But, coincidentally, “It just came to a point where the whole formula”—a kitchen that was too small, rising rents, higher taxes, the increasing desire to not work 70 hours a week, etc.—“just didn’t work anymore,” he says. Chef-owner Sam Crannell gets his hands dirty, shaping the dough for pizzas at South Town. Photo by Alex Crook. Diners benefit from his focus on details; the crust—made with flour from Walla Walla producer Small’s Family Farm—is very thin and has a good chew, with toppings reaching nearly to the edge. His 18-inch signature pizzas are a mix of basic necessities—classics like pepperoni or sausage ($3.75 per slice, $23 for a whole pizza)—and impressively executed originals, like the pastrami pizza ($26), with dill pickles, Gruyère fondue and a crust dusted in a garlic, onion and seed mixture meant to mimic an “everything” bagel. (I dare say that pastrami pie is worth the drive to South Park, in rush hour, from even the north end of the city.) He even offers one “unicorn pie” ($4.50 per slice) a day, topped with whatever pops into his mind. Although Crannell says he’s happy for the moment to be the guy behind the pizza oven, he also says the time will come when he won’t be involved in the day-to-day operations at South Town. He admits he’s not the sort who can sit still for too long; he’s already planning to start R&D on a new project this fall. He jokes: “I’ve got too much love to give.” And the proof is in the pizza.